Rather than crushing them with too much information and making it hard to find useful material, most Americans say the internet and cell phones have brought benefits in learning, sharing and diversifying the flow of information into their lives. A new survey by the Pew Research Center finds that the vast majority of Americans believe their use of the web helps them learn new things, stay better informed on topics that matter to them, and increases their capacity to share ideas and creations with others. These generally positive attitudes are buttressed by the view that people like having so much information at their fingertips, rather than feeling information overload. Moreover, this positive judgment extends to the broader culture. Most believe that average Americans and U.S. students are better informed than in the past. The survey of 1,066 internet users shows that 87% of online adults say the internet and cell phones have improved their ability to learn new things, including 53% who say it has improved this “a lot.”1 Internet users under age 50, those in higher income households, and those with higher educational attainment are especially likely to say the internet and cell phones help them “a lot” when it comes to learning new things. Asked if they enjoy having so much information at their fingertips or if they feel overloaded, 72% of internet users report they like having so much information, while just 26% say they feel overloaded. Products and services: 81% of online Americans report their internet and cell phone use has made them better informed about products and services today than they were five years ago. News: Substantial majorities also feel better informed about national news (75%), international news (74%), and pop culture (72%) because of these tools. Friends: 67% of online adults say they are better informed about friends than they were five years ago, and 60% feel they know more about family. 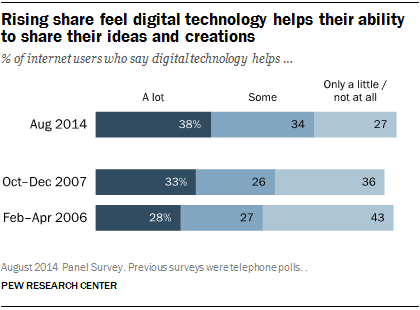 Sharing ideas: In addition, 72% of internet users say digital technologies have improved their ability to share their ideas and creations with others. These figures have risen since 2006, when we found that 55% of online adults felt the internet improved their ability to share their ideas and creations. It is likely that a major contributor to the increase in this measurement is the rise of social networking sites, which were not heavily in use in in 2006. Social networking sites are used by more than two-thirds of those who go online now. Average Americans and students are better informed: Overall, internet users believe that both the average American and the average student today are better informed thanks to the internet. Perhaps surprisingly in both cases, internet users under age 30 are less likely to believe the internet is making average Americans or today’s students better informed. Instead, they are more likely than their older counterparts to say the internet has had no real impact—19% of young adults say so, compared with 9% percent of those ages 30 and older. The analysis in this report is based on an online probability survey conducted September 12-18, 2014 among a sample of 1,066 adult internet users, 18 years of age or older. The survey was conducted in English by the GfK Group using KnowledgePanel, its nationally representative online research panel. Sampling error for the total sample of 1,066 respondents is plus or minus 3.3 percentage points at the 95% level of confidence. For more information on the GfK Privacy Panel, please see the Methods section at the end of this report.